From out of nowhere Apple has revived the iPad Air range with a new 10.5-inch model. The new model includes some features that previously you’d have had to buy an iPad Pro to get, yet it has a price tag closer to the iPad 9.7 from 2018. Highlights include a high-end chipset, a True Tone screen, Apple Pencil support and even support for the Smart Keyboard. Below you’ll find everything you need to know about the new iPad Air, including how much it costs, when you can buy it, and all the specs and features. The iPad Air 10.5 is up for pre-order now and will be available starting sometime next week (the week commencing March 25). If you want to get your hands on it, you’ll have to pay at least $499 / £479 / AU$779 / AED 1,999, which will get you a 64GB Wi-Fi-only model. For a 64GB Wi-Fi plus cellular model you’re looking at $629 / £599 / AU$979 / AED 2,529, a 256GB Wi-Fi-only version costs $649 / £629 / AU$999 / AED 2,599, and at the top-end a 256GB one with both Wi-Fi and cellular connectivity will set you back $779 / £749 / AU$1,199 / AED 3,129. The iPad Air 10.5 has more in common with older iPad Air models and with the likes of the iPad 9.7 (2018) than with the iPad Pro 11. Which is to say, it holds on to the home button and Touch ID, rather than ditching them for Face ID. Whether that’s good or bad is subjective, but it does mean the bezels are bigger than on Apple’s latest Pro model. It also includes a 3.5mm headphone port and comes in at 250.6 x 174.1 x 6.1mm and either 456g (if you go for a Wi-Fi model) or 464g (if you opt for cellular). The slate is available in silver, space grey and gold shades. The screen meanwhile is of course 10.5 inches. It has a 1668 x 2224 resolution amounting to 264 pixels per inch – roughly the same pixel density as the iPad Pro 11. It includes True Tone as well, meaning the white balance is dynamically adjusted based on the light around you. There’s an A12 Bionic chipset and a neural engine inside the iPad Air 10.5. That’s the same chipset as you’ll find in the iPhone XS, but a slightly older one than is powering the iPad Pro 11. Still, that should make it plenty powerful. In typical Apple fashion the company hasn’t revealed how much RAM the slate has, but we do know that – unsurprisingly – it’s running iOS 12, which is the latest version of Apple’s operating system. The iPad Air 10.5 has an 8MP f/2.4 rear camera and a 7MP f/2.2 front-facing one. Both lenses can also record video at up to 1080p. Apple hasn’t said what size the battery is, but the company has said that it will last for up to 10 hours of web browsing over Wi-Fi or of video watching. That’s a pretty standard claim from Apple, but we’ll let you know how it holds up in practice once we’ve put the slate through a full review. To recharge it you’ll use a Lightning cable, rather than USB-C. 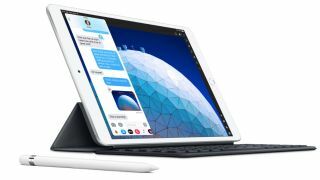 Beyond the core specs, highlights of the iPad Air 10.5 include support for the Apple Pencil and the Smart Keyboard. The former isn’t very surprising, since the iPad 9.7 (2018) also supports it, but Smart Keyboard support has so far been exclusive to the iPad Pro range. So this could be a cheaper way to get an iPad that comes close to being a laptop alternative, and with the 10.5-inch screen it shouldn’t feel too cramped as one. We’ll let you know how it fares in our full review.